British star Amir Khan has given us yet another nail-biting thriller. Tonight in Birmingham, the 31 year old won the second fight of his latest comeback, but just barely. 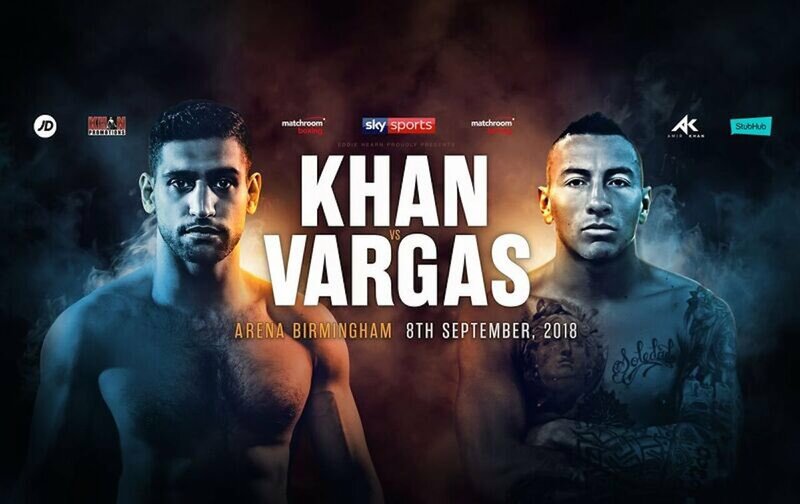 Facing tough Colombian Samuel Vargas, Khan survived a knockdown, some other heavy exchanges and fatigue to pound out a wide unanimous decision win that will look far better on paper compared to Khan’s shaky, vulnerable performance. In the end, after another action fight involving Khan, the former 140 pound champion won by scores of 119-108, 119-109 and 118-110. But in no way do these lopsided scores tell the full story. Khan won to improve to 33-4(20) but once again his chin came oh so close to letting him down. 29 year old Vargas, a whopping great underdog, showed incredible heart and grit but he is now 29-4-2(14). Khan started out well, using his fast hands to dominate things. Things looked even better for Khan in round-two, as he decked Vargas a few seconds into the round and had him in real trouble. But then, right at the end of this round, a huge Vargas right hand to the head returned the favour and sent Khan crashing to the mat. High drama in an Amir Khan fight once again. Khan put Vargas down again in the third but the war raged on. Bloodied but unbowed and always dangerous, Vargas pushed Khan to the limit tonight. It was a great action fight, full of drama, yet as an advert for his remaining years/fights in the sport this one really did not do Khan too many favours. Vargas took a real hammering in the fifth, with Khan’s fast combos tattooing the younger man. But Vargas took it all and kept coming. Khan was now feeling the pace, having had so little ring action over the last two or so years. Wobbled again in the seventh, Khan was having to grit his teeth. It was a battle of attrition in the remaining five rounds but Khan was doing more work, letting his still-fast but now less powerful hands go. At times it looked like the fight still might not go down to the wire – Khan again badly hurt at the end of round-ten – but somehow it did. Khan was a clear winner but, as Carl Froch said on air, none of the top welters will have seen anything to worry about in tonight’s fight. Indeed, can Khan ever reach the top again? Did Khan earn himself his dream fight with Manny Pacquiao with tonight’s effort?